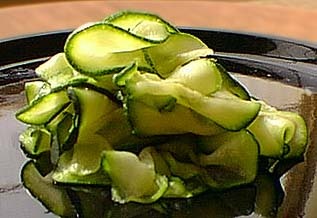 I find that cooked zucchini is usually watery and tasteless unless you extract all of its water before cooking. This recipe concentrates the flavor of the zucchini by first removing most of its water, then baking the zucchini slices in a casserole smothered with a thick tomato sauce, in a modified rago�t style. It's a perfect vegetable accompaniment to sausages, steaks grilled on the BBQ or a rack of lamb. It can also be served cold as a vegetable salad or spread on toasted baguette slices, in a French version of an Italian bruschetta. Slice 6 medium-sized zucchini into thin slices. Place the slices in a large non-aluminum colander and salt liberally, shaking the slices to distribute the salt evenly. Place the colander in the sink or on a deep plate to catch the water which the salt will extract. Let the salted zucchini slices sit for 30 - 60 minutes. Rinse off the salt thoroughly, then extract the remaining water by squeezing small handfuls of the zucchini. Fluff them up with your fingers to separate the slices. Makes 4 cups. Gently saut� the dewatered zucchini in oil olive over low heat in a large flat-bottomed frying pan for about 15 minutes, until the slices become translucent. Don't let them brown and don't stir too much to prevent mashing the delicate slices. Set aside until ready for final assembly and baking. Roast about 12 Roma tomatoes using the technique described in the Roasted Roma Tomato Tarte recipe. Cook the tomato puree in 3 TBS olive oil in a deep sauce pan, stirring frequently, until reduced to 1 1/3 cups. Season with a large pinch of Herbes de Provence, freshly ground pepper and 3 TBS white wine vinegar. Mix the saut�ed zucchini with the thick tomato sauce. Taste for salt. Arrange in shallow casserole and lightly cover with aluminum foil. Bake in a 325� oven for 40 minutes. Thin slices: It is easier to get uniformly thin slices using a mandolin and not so easy to do by hand. I use the thinnest setting on my mandolin. Squeezing: For a more thorough job, you can wring out small batches using a dish towel. It's important to get out as much water as possible at this stage, but be careful not to tear or mash the zucchini slices. French-style tomato sauce: I call this "French-style" because it doesn't use any garlic and it's seasoned with Herbes de Provence instead of the classic basil and oregano. Deep sauce pan: The tomato puree will be quite thick even before it is reduced. To prevent it from spattering on your stove during reduction, use a deep sauce pan. Vinegar: This is a secret ingredient in many successful sauces. Used in moderation, vinegar can brighten the flavor of most sauces, bringing out the sauce's depth and character. In a traditional ratatouille, red wine vinegar is a basic ingredient. Salt: If you didn't rinse the zucchini well enough before dewatering, it could still be quite salty. To avoid a common cooking error of cumulative salt, don't salt the sauce. Add salt only after assembling the sauce with the zucchini and after tasting carefully at this last stage.